Son of Ahikam, through whose influence Jeremiah was saved from the fury of the mob, and grandson of Shaphan the scribe (Jer. xxvi. 24; II Kings xxii. ; II Chron. xxxiv. ); probably cousin of Michaiah, son of Gemariah (Jer. xxxvi. 11). 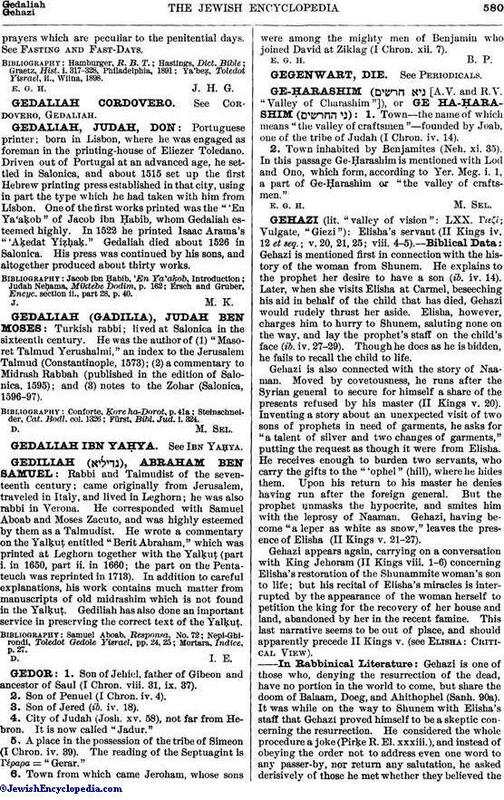 Gedaliah was thus a scion of a noble and pious family. Nebuchadnezzar appointed him governor of Palestine after the conquest of the land, and entrusted Jeremiah to his care (Jer. xxxiv. 14, xl. 5). Gedaliah made Mizpah his capital, where the scattered remnants of the nation soon gathered round him. Not only the poor peasants and laborers, but also the generals and military men came back from their hiding-places among the surrounding tribes, and settled in the deserted towns of Palestine. Gedaliah exhorted them to remain loyal to the Babylonian rulers, and to lay down their arms and be-take themselves to agriculture and to the rebuilding of their razed cities. He permitted them to gather the crops on lands which had no owner. Baalis, king of the Ammonites, envious of the Jewish colony's prosperity, or jealous of the might of the Babylonian king, instigated Ishmael, son of Nathaniel, "of the royal seed," to make an end of the Judean rule in Palestine, Ishmael, being an unscrupulous character, permitted himself to become the tool of the Ammonite king in order to realize his own ambition to become the ruler of the deserted land. 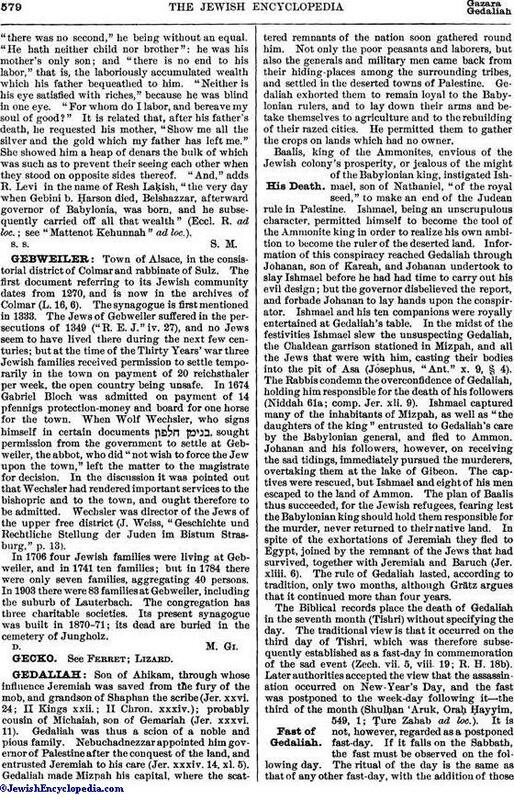 Information of this conspiracy reached Gedaliah through Johanan, son of Kareah, and Johanan undertook to slay Ishmael before he had had time to carry out his evil design; but the governor disbelieved the report, and forbade Johanan to lay hands upon the conspirator. Ishmael and his ten companions were royally entertained at Gedaliah's table. In the midst of the festivities Ishmael slew the unsuspecting Gedaliah, the Chaldean garrison stationed in Mizpah, and all the Jews that were with him, casting their bodies into the pit of Asa (Josephus, "Ant." x. 9, § 4). The Rabbis condemn the overconfidence of Gedaliah, holding him responsible for the death of his followers (Niddah 61a; comp. Jer. xli. 9). Ishmael captured many of the inhabitants of Mizpah, as well as "the daughters of the king" entrusted to Gedaliah's care by the Babylonian general, and fled to Ammon. Johanan and his followers, however, on receiving the sad tidings, immediately pursued the murderers, overtaking them at the lake of Gibeon. The captives were rescued, but Ishmael and eight of his men escaped to the land of Ammon. The plan of Baalis thus succeeded, for the Jewish refugees, fearing lest the Babylonian king should hold them responsible for the murder, never returned to their native land. In spite of the exhortations of Jeremiah they fled to Egypt, joined by the remnant of the Jews that had survived, together with Jeremiah and Baruch (Jer. xliii. 6). The rule of Gedaliah lasted, according to tradition, only two months, although Grätz argues that it continued more than four years. The Biblical records place the death of Gedaliah in the seventh month (Tishri) without specifying the day. The traditional view is that it occurred on the third day of Tishri, which was therefore subsequently established as a fast-day in commemoration of the sad event (Zech, vii. 5, viii. 19; R. H. 18b). Later authorities accepted the view that the assassination occurred on New-Year's Day, and the fast was postponed to the week-day following it—the third of the month (Shulḥan 'Aruk, Oraḥ Ḥayyim, 549, 1; Ṭure Zahab ad loc.). It is not, however, regarded as a postponed fast-day. If it falls on the Sabbath, the fast must be observed on the following day. The ritual of the day is the same as that of any other fast-day, with the addition of thoseprayers which are peculiar to the penitential days. See Fasting and Fast-days. Ya'beẓ, Toledot Yisrael, ii., Wilna, 1898. E. G. H. J. H. G.